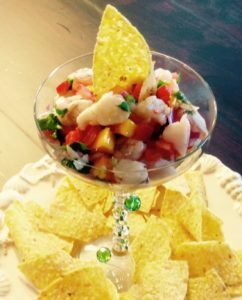 Ceviche can be made many different ways and is light and refreshing! I chose to use cod because we had caught it on our Alaskan adventure, but also chose to add shrimp as well. All the ingredients need to be diced into very small pieces so a sharp knife is key and knife skills. I added the Mango Aged White Balsamic Vinegar from Spicewood Food Company and can be ordered on-line at Spicewood. I highly recommend using it, because it really popped it with flavor. If you don’t have it, it will still taste good. Dice fish and shrimp into very small pieces and add to a bowl. Squeeze the limes over the seafood, stir and set aside. The number of limes used depends on how juicy they are – should be about a quarter cup. This will essentially “cook” the seafood. Dice the remaining ingredients and add to a separate bowl. Stir in seafood and lime juice, vinegar and add kosher salt to taste. Serve with tortilla chips and enjoy!